For most readers I don’t need to explain why this matters, but in case you’re new to the debate, when enabled, DNT sets a “flag” telling websites that you don’t want data about your visit to be used for purposes of creating a profile of your browsing history (or for any other reason). Whether we like it or not, such profiles have driven a very large business in display advertising over the past 15 years. Were a majority of consumers to implement DNT, the infrastructure that currently drives wide swathes of the web’s monetization ecosystem would crumble, taking a lot of quality content along with it. Once released, it’s estimated that IE 10 could quickly grab as much as 25-30% of browser market share. The idea that the online advertising industry could lose almost a third of its value due to the actions of one rogue player is certainly cause for alarm. Last week’s press were full of conspiracy theories about why Microsoft was making such a move. The company claims it just wants to protect users’ privacy, which strikes me as disingenuous – it’s far more likely that Microsoft is willing to spike its relatively small advertising business in exchange for striking a lethal blow to Google’s core business model, both in advertising and in browser share. I’m quite certain the Windows 8 team is preparing to market IE 10 – and by extension, Windows 8 – as the safe, privacy-enhancing choice, capitalizing on Google’s many government woes and consumers’ overall unease with the search giant’s power. I’m also quite certain that Microsoft, like many others, suffers from a case of extreme Apple envy, and wishes it had a pristine, closed-loop environment like iOS that it could completely control. In order to create such an environment, Microsoft needs to gain consumer’s trust. Seen from that point of view, implementing DNT as a default just makes sense. But the more I think through it, the more I’m somewhat unperturbed by the whole affair. In fact, I’m rather excited by it. 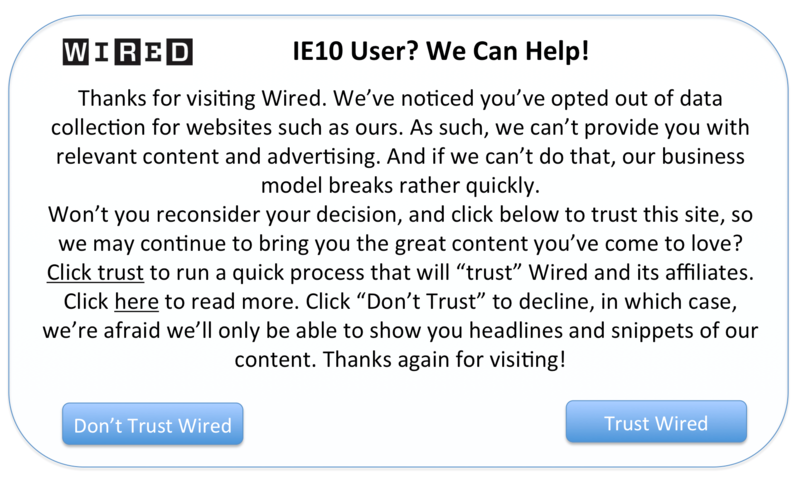 First off, it’s not clear that IE10’s approach to DNT will matter. When it comes to whether or not a site has to comply with browser flags such as DNT, websites and third party look to the standard settings body knows as the WC3. That organization’s proposed draft specification on DNT is quite clear: It says no company may enforce a default DNT setting for a user, one way or the other. In other words, this whole thing could be a tempest in a teapot. Wired recently argued that Microsoft will be forced to back down and change its policy. But I’m kind of hoping Microsoft will keep DNT in place. I know, that’s a pretty crazy thing for a guy who started an advertising-run business to say, but in this supposed threat I see a major opportunity. To me, this presents a huge opportunity for the owner of a site to engage with its readers, and explain quite clearly the fact that good content on the Internet is paid for by good marketing on the Internet. And good marketing often needs to use “tracking” data so as to present quality advertising in context. (The same really can and should be said of content on the web – but I’ll just stick to advertising for now). Advertising and content have always been bound together – in print, on television, and on the web. Sure, you can skip the ad – just flip the page, or press “ffwd” on your DVR. But great advertising, as I’ve long argued, adds value to the content ecosystem, and has as much a right to be in the conversation as does the publisher and the consumer. Do Not Track provides our industry with a rare opportunity to speak out and explain this fact, and while the dialog box I’ve ginned up at the top of this post is fake, I’d love to see a day when they are popping up all over the web, reminding consumers that not only does quality content need to be supported, in fact, the marketers supporting it actually deserve our attention as well. At present, the conversation between content creator, content consumer, and marketer is poorly instrumented and rife with mistrust. Our industry’s “ad choices” self regulatory regime – those little triangle icons you see all over display ads these days – is a good start. But we’ve a long way to go. Perhaps unwittingly, Microsoft may be pushing us that much faster toward a better future. 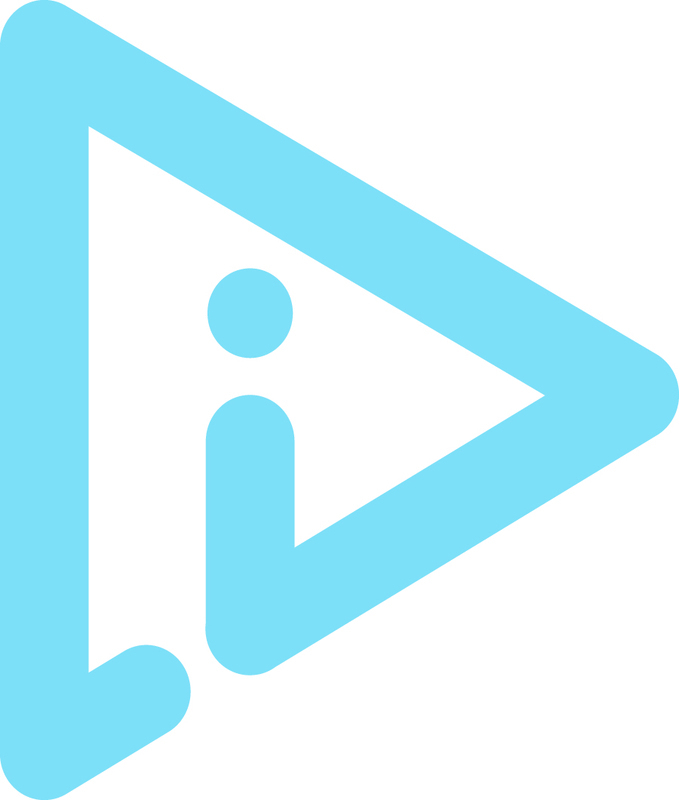 *I am on the board of the IAB, one of the major industry trade groups which promotes self-regulation. The opinions here are my own, as usual. Good article, as always. Also, the faux DNT box at the top would actually work well. After awhile, Trust, Don’t Trust is all that’s needed. I like that DNT movement. It’s not about “Don’t trust Wired”. It’s misleading to equate Do not track with do not trust. 2 different things. DNT just wipes out everything. Finally someone admitting this may be an opportunity for publishers. Interesting to see how it pans out. And yes, I’m excited about it too. It’s about time publishers starting having a more robust dialog with their readers as they bounce around their sites… I wish content was dynamically served like ads, in fact. This will still remain a problem in the B2B environment , where many users have little to no control of setting on their office desktop. Interesting that the relationship between advertising revenue and content is assumed even for B2B markets. Unlike B2C where sales are based on persuading people generally to purchase things they don’t don’t ‘need’. In B2B buying is often not an option, the option is in choosing from whom you buy and what characteristics a product or services offers. Under these situations the best promotion is referral, reputation and factual accounts that detail reasonable client expectation. Brand is simply a proxy for these. Therefore business models that inform, provide services, or source or and / or compare products can thrive. This article wipes these out as possibly being “good content”. In reality, if an era of austerity is ahead of us, it may be worth noting that apart from purely informative content offered by advertisements, and pure entertainment (good ads do entertain), all other aspects of advertisement are entirely parasitic on added value and constitute a race to the bottom or a tragedy of the commons. Companies only advertise because their competitors do – no net benefit is generated. John – I actually think that for the B2C market you are spot on with your analysis – I simply feel that the B2B market has huge scope for you media guys to innovate, to aid discovery , engagement and connection, and that social media statistics are merely one facet of the industry – and not the most important. I like the B2B market a lot, and think branding plays a major role there as well. John – greater engagement is well and good but Wired won’t be affected as much as others.As a “first party” under DNT it can collect what is likes on its sites, form profiles and sell ads based on that. That is decent ad revenue. Same with Facebook, Google Search, Promoted Tweets,Bing ads – first parties. it’s only when a site uses a third party (eg a network or data provider) that DNT operates. So DNT on 30% of browsers hurts big media like wired and the New York Times (doesnt touch Bing, Google or Facebook who have all the first party data they need) and may push them to paywalls for the shortfall, but it kills small sites and a generation of ad tech startups. And data becomes siloed by site. What Sword – you mean having to threaten to hold content back? The sword is the blunt default-ON option, with an entirely arbitrary and invented definition of what “tracking” is and isn’t. This threatens to put sites and services’ revenues at the whim of a small elite of browser makers and it hurts their ability to harness useful third party data. Forcing business models on content and web service providers, and causing the silo’ing of data among separate first parties (large media sites and tech conglomerates), for nominal privacy gains is bad for users and society too. Interesting analysis. Perhaps the ideal dialog box would have a third button: “One-click payment of $1 dollar for a month’s full access”. Some people will prefer to cut out the middleman and pay for content directly. Yes, and I can imagine many other approaches as well. The point is to get some kind of back-and-forth based on the value exchange to become rote.